Only 44% of the 3,773 IT and IT security practitioners surveyed say their company uses end-to-end encryption for payment data as it moves from the POS terminal and then transmitted to the financial institutions. On January 26th, Gemalto released their Global Study on the State of Payment Data Security Study conducted by the Ponemon Insitute. The purpose of this research was to focus on the approach that organizations are taking to secure payment data. The majority of companies represented in this study (54% of respondents) have had a security or data breach involving payment data an average of four times in the past two years. The uncertainty of knowing the location and storage of their payment data is a major risk for companies. 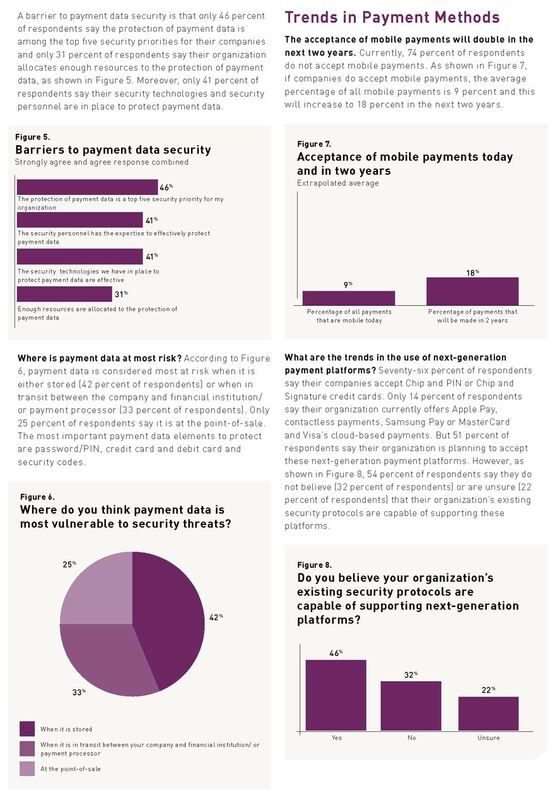 80% of respondents say this is a very high (42%) or high (38%) risk to payment data. 62% of respondents say if data is not stored in the cloud it is mainly stored in a centralized storage facility (within data centers). More payment data will move to the cloud but only 45% say they use encryption, tokenization or other cryptologic tools to protect data in the cloud. Only 44% of respondents say their company uses end-to-end encryption for payment data as it moves from the POS terminal and then transmitted to the financial institutions. 32% say they only encrypt data as it is sent to the financial institution or when it is stored (29% of respondents). However, 70% of respondents say they use encryption or tokenization to protect data as it is captured at the point of sale. Compliance with PCI DSS is not considered sufficient for ensuring the security and integrity of payment data, according to 31% of respondents. In fact, only 17% of respondents say PCI DSS is essential and 18% of respondents say it is very important to achieving a strong payment data security posture.